John was born in Hamilton in 1955, was raised in Stoney Creek. He graduated from Orchard Park Secondary School and Mohawk College. He was a Heating / Air Conditioning Technician for over 40 years, retiring in 2015. A devoted family man, John and his wife Linda have been married for over 41 years and have two daughters and five grandchildren. Michelle and Tom have two daughters, Emily and Megan, and Lisa and Mike have three children, Mason, Brianna, and Jacob. 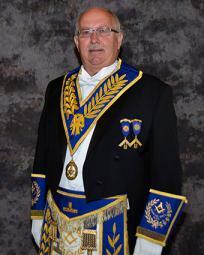 John's Masonic Career began in 1987. He was Installed as W.M. of Hamilton Lodge No. 562 in 1994-1995 and served a second term in 1995-1996. He became W.M. of Meridian Lodge No. 687 in 2005-2006. John's other interests include spending quality time with his family at the cottage, snowmobiling, boating, his classic car, and for 38 years and counting, putting on a special red suit at Christmas and bringing gifts and Christmas wishes to all.